However, for a brief moment I slipped off my footwear and made my way through the mist rain to the orange tree, bare toes on cold, wet grass. Now that winter has finally come the oranges are ripe. As I twisted off the first one to come away from the tree with the ease of readiness, it struck me how rich the moment was – cold but not too cold, fresh with wetness, showered by the the branch springing back as the orange came away in my hand. How bright the orange against the green and grey of this day. How lovely this simple act. Somewhere in this rain, between the rose-leaves holding onto their scrying-globe raindrops, lurked stories – a whisper of otherworldliness caught in the old strands of web, no longer used. Rich earth smells mingled with the chatter of birds gathering for an early night. 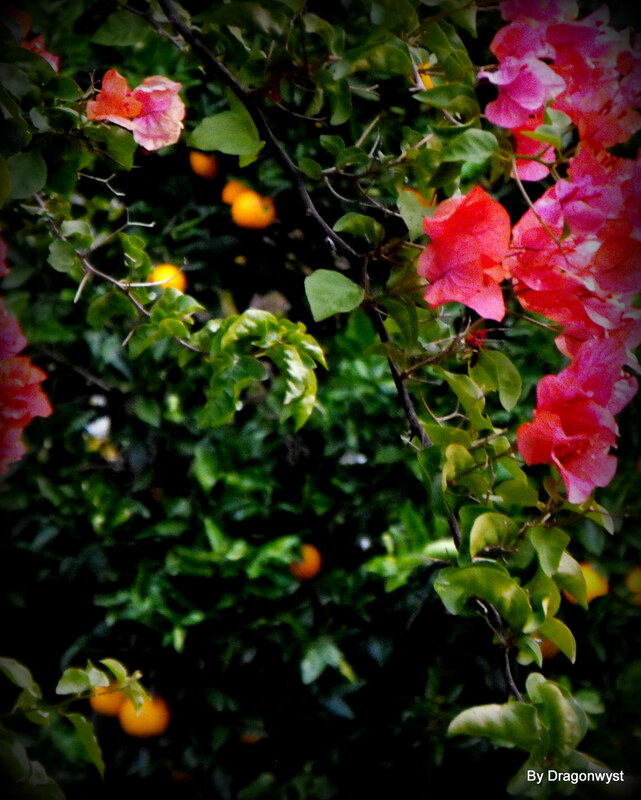 With an armful of oranges I paused and listened to the two-fold nagging in my heart. Here I am, middle aged and greying and still I haven’t achieved the two things that mattered most….or have I? And which part matters more? For years I have wanted to be a counsellor, but despite the courses I have done, still I am not one – not in the career-path sense. None of my courses allow me that, and the one that could, I am finding presented in a way that is so boring as to leave me hating something I have loved. Nevertheless, I am able to provide support and listen when needed. The second thing is to write and be published – published how? In what format? By whom? I’ve had poems published, and articles – just not in the money-earning sense. Nevertheless I’ve had things chosen for publication, not just self-published. How do I balance the waiting and listening and trusting that things will unfold as they ought, with the dread of one-too-many missed opportunities? Still, there is this: the gentle rain the soaking earth beneath my bare feet, fruit of the orange tree, raindrops in my hair. There is this moment and writing it, as I absorb my life experiences and mull over and draw from them, just as the rain soaks into the earth and the tree gives it back in the oranges. This is the calling: the magic of alchemy. ~ by Dragonwyst on June 3, 2012.
very beautiful, dw. your writing is a delight to read. That day will come – when I stop trying to write everything I think I should be writing and give myself to write the one thing I most should be writing but which feels sort of self-indulgent. I have a sneaky suspicion I have to let myself autobiographically. I am reminded of a book i once owned and lost through lending: Madeleine L’Engle’s Circle of Quiet. that’s the sort of book I envisaged myself writing back when I was in my 20s. the trouble is, that sort of book needs years behind it – life lived and stored away in the treasure chest. It might just be that I’m at that point. it’s time to give myself permission to be that sort of writer – first – and then the rest will come.